If you need to pinch your forefinger and thumb together and swipe out in order to enlarge images, they are probably too small. Ideally, you want visitors to be able to navigate through your website using only one hand. It can be frustrating for the mobile user to accidentally click on items that they didn’t mean to click on. Avoid this by making your items large enough to click on without zooming out so that visitors need to put in little effort to scroll through your eCommerce site. It may appear decent on a large computer screen, but your website can easily look cluttered on a mobile device, and this can turn away many visitors. Keep the design simple so that potential customers are not overwhelmed when they first see your site. First impressions are crucial, and it only takes a few seconds for people to make a judgement on your company based on web design alone. The Commerce Shop’s expert team of web developers can help you build an eCommerce website with a data-backed design that will deliver results and give customers the best mobile experience possible. After making sure that your web design isn’t distracting for visitors, it’s time to take a close look at the content of your eCommerce site. Too much content can also be a lot for mobile users to handle, and some of it may need to be omitted. However, you don’t have to get rid of all the content. There are ways that you can rearrange this content in order to make it appear not so cluttered. Putting information in drop-down menus is one way to do this. Use whitespace around your text so that your content doesn’t overwhelm visitors. If you require users to fill out any information on your site, it is better to make it minimal. Customers are not fond of filling out forms, and they are more likely to abandon the effort if it becomes too tedious. Have them fill out only what is absolutely needed, such as a name and phone number. Rather than have them fill out their location, GPS technology may be used to acquire this information instead. Shopping cart abandonment is a large problem facing eCommerce stores today. By making the process more complicated than it should be, you could be losing a good amount of potential customers. You can make it easier for mobile users in a variety of ways, one of which is by implementing a “one-click” purchase button. Another way is to allow users a “guest-checkout” option so that they do not need an account in order to purchase from your shop. Finally, you can use a GPS system that automatically fills out their location during checkout, and give them the option to use the same address for both shipping and billing in one easy click. Apps are a great way to convert mobile traffic into sales, because they make purchasing much easier on eCommerce websites. This is a good choice for websites who get many repeat customers that are loyal to your store. If you have a dedicated following, an app will make them more likely to make impulsive purchases. Online stores that simply get a lot of drive-by traffic may not benefit from creating their own app because these customers may not be likely to download it. Whether visitors are browsing on their computer, tablet, or smartphone, it’s critical that your eCommerce website has a responsive web design. 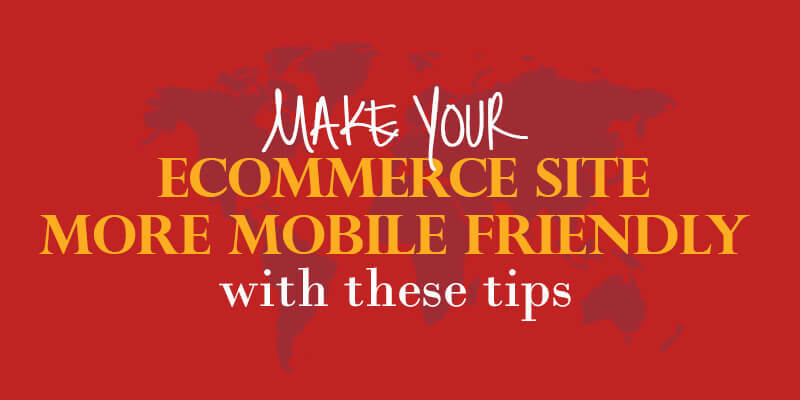 It may seem daunting, but making your online store as mobile-friendly as possible will no doubt lead to increased conversion rates. Give your visitors a great online shopping experience, no matter what device they use, and your eCommerce website will come out on top.